How do I cook it? Using a sharp knife, slice both Top Blade cuts against the grain into 1/4 inch thick pieces. Combine all marinade ingredients in a small bowl. In a large bowl, mix sliced beef with dry seasonings and 1 tablespoon of canola oil. Cover and let marinade for 1 hour before grilling. Heat a cast iron griddle over medium-high heat until the griddle is very hot. In a bowl, toss sliced bell peppers and onions with remaining oil and saute on the griddle for 7 to 8 minutes. You want to sear the vegetables with some blackening on the edges. Add the seasoned sliced beef to the hot griddle and sautŽ until browned, about 5-6 minutes. Mix the vegetables and sliced beef together and continue to cook for an additional 1-2 minutes. 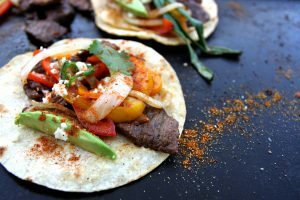 Serve fajitas at once in warm corn or flour tortillas and garnish with chopped cilantro, crumbled Cotija cheese, sliced avocado and sour cream.